Looking for an affordable and long-lasting disaster preparedness food? Stock up your emergency supplies with food bars. With a five-year shelf life and an affordable cost, these wafers are the perfect emergency food rations. This particular pack comes with nine food bars totaling 3600 calories. All nine taste like a coconut cookie and are delicious! 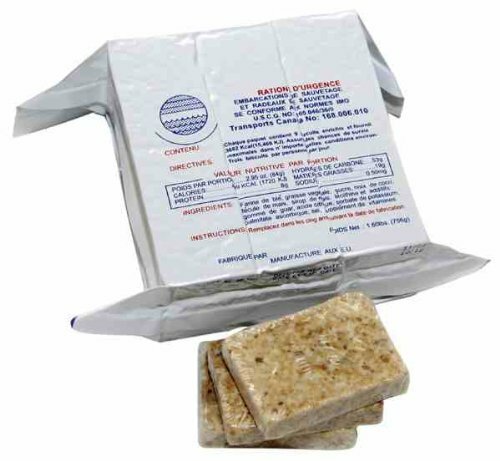 The emergency food ration bar is US Coast Guard approved and is able to stand up to hot and cold temperatures. As such, they’re one of the best disaster foods on the market. Buy enough for the whole family today. You’ll be glad you did when disaster strikes. Ingredients: Sugar, Enriched Wheat Flour, Partially Hydrogenated Vegetable Shortening (Soybean & Cottonseed Oils), Corn Starch, Wheat Gluten, Dextrose, Desiccated Coconut Preserved with Sodium Metabisulfite, Corn Syrup, Contains less than 2% of the following: Soy Lecithin, Guar Gum, Calcium Propionate Preservative, Citric Acid, Salt, Ascorbic Acid, Ascorbyl Palmitate, Niacin, Vitamin A, Palmitate, Riboflavin, Thiamine Mononitrate.